Open year around, any hour of the day or night. Carson City, Douglas County, Mineral County, Storey County and Washoe County: The limit is 5 trout, 10 mountain whitefish and 15 warmwater game fish of which not more than 5 may be black bass. Churchill County and Lyon County: The limit is 5 trout, 10 mountain whitefish and 15 warmwater game fish of which not more than 5 may be black bass and 5 may be walleye. Humboldt and Pershing County: The limit is 5 trout and 15 warmwater game fish of which not more than 5 may be black bass and 5 may be walleye. In the waters of the Truckee River, from 1000 feet below Derby Dam downstream to the Pyramid Lake Paiute Reservation boundary, only artificial lures with single barbless hooks may be used from February 1 through May 31. Only one single barbless hook may be attached to each hook eye or ring of the lure. See Statewide Regulations for further information. See Fishing with Bait Fish. The Western Region includes the nine counties of northwestern Nevada: Carson City, Churchill, Douglas, Humboldt, Lyon, Mineral, Pershing, Storey and Washoe. Several popular fishing waters are located within this region including Lake Tahoe, Topaz Lake, Knott Creek Reservoir, Pyramid Lake, and the Truckee, Carson and Walker River systems. Pyramid Lake is managed by Pyramid Lake Paiute Tribe. Please contact the Pyramid Lake Paiute Tribe for regulations and license requirements pertaining to Pyramid Lake. Waters that are popular for warmwater species are Lahontan, Chimney and Rye Patch Reservoirs, Humboldt River, Washoe Lake, Mason Valley Wildlife Management Area and several canals and drains in the Lahontan Valley. The Western Region office is located at 1100 Valley Road, Reno, NV 89512, (775) 688-1506. Important Note: Within the Western Region the general fishing seasons, hours, limits, and regulations apply to all waters EXCEPT those listed under “Western Region Special Regulations.” If the water in which you intend to fish is not listed under the Region’s Special Regulations, then the General Regulations shall apply. All game fish must be dead before being transported away from the body of water where caught. Season is open year around during the hours the park is open to the public. Limit is 3 game fish. Special Regulations: Persons under 16 years of age are not required to have a fishing license. Persons 16 years of age or older must have either a Nevada fishing license or a Nevada Interstate Boundary Waters license; a Nevada short-term fishing permit or a California fishing license. Season is open year around, 1 hour before sunrise to 2 hours after sunset, except for the following closed areas: within a 200 yard radius of the mouths of Third, Incline and Wood Creeks; 500 yard radius from Sand Harbor Boat Ramp; and within the boat launch area inside the jetty at Cave Rock Boat Ramp. Limits are 5 game fish of which not more than 2 may be mackinaw (lake trout). Season is July 15 through Sept. 30, 1 hour before sunrise to 2 hours after sunset. Season is open year around, any hour of the day or night except for the Lahontan Dam spilling pool (bowl) which is closed to fishing. Limit is 15 game fish of which not more than 5 may be black bass, 5 may be walleye, and 2 may be white bass or white bass hybrids (wiper) 15 inches total length or longer. White bass or white bass hybrids (wiper) under 15 inches may be included in the 15 game fish limit. Season is open year around, any hour of the day or night. Limit is 25 game fish of which not more than 5 may be black bass and 5 may be walleye. Season is open year around, during the hours the park is open to the public. Season is open year around, hours when park is open to the public. Season is open year around, 1 hour before sunrise to 2 hours after sunset. Season is open January 1 through September 30, 1 hour before sunrise to 2 hours after sunset, except for the area within the jetties of Topaz Marina which is closed to fishing. Special Regulations: These limits need to moved up to limit for topaz lake next to the limit is 5 trout. There is no chumming at Topaz Lake (see Statewide Regulations). Persons under 16 years of age are not required to have a fishing license. Persons 16 years of age or older must have either a Nevada fishing license or a Nevada Interstate Boundary Waters license; a Nevada short-term fishing permit or a California fishing license. DOUGLAS COUNTY CLOSED WATERS: Lake Tahoe within the boat launch area, inside the jetty at the Cave Rock boat ramp, north end. Glenbrook Creek from Lake Tahoe to Hwy 50. Topaz Lake within the jetties of Topaz Marina. Season is open the second Saturday in May through the last day of February, any hour of the day or night. Season is open year around any hour of the day or night. Limit is 5 game fish. Special Regulations: The reservoir has been dry for several years, check on conditions before heading out. Season is open the second Saturday in June through November 15, any hour of the day or night. Special Regulations: Only boats without motors are permitted and the area is closed to vehicular traffic. Limit is 15 gamefish of which not more than 5 may be black bass, 5 may be walleye, 2 may be white bass hybrid (wiper) and zero (0) may be tiger muskie (catch and release only). The minimum length for white bass hybrid is 15 inches total length. Limit is 1 trout, minimum size 18 inches total length. Special Regulations: Only artificial lures with single barbless hooks may be used. Boats must be operated at a speed that leaves a flat wake. HUMBOLDT COUNTY CLOSED WATERS: All tributaries to Summit Lake. All waters of the Sheldon National Wildlife Refuge (within Humboldt County) except Big Springs Reservoir and Dufurrena Ponds. Crowley Creek in the Montana Mountains. Eightmile Creek in the Santa Rosa Range. Donnelly Creek in the Calico Range. Limit is 5 trout, 10 mountain whitefish and 15 warmwater game fish of which not more than 5 may be black bass except in that portion of the East Walker River which is from ¼ mile above the confluence of the East Walker River and Sweetwater Creek downstream to ½ mile below the confluence of the East Walker River and Red Wash Creek, which is catch and release fishing only. Only artificial lures with single barbless hooks may be used. Season is open the second Saturday in February through September 30, 1 hour before sunrise to 2 hours after sunset. Limit is 15 game fish of which not more than 2 may be black bass and 5 may be trout. Minimum size for black bass is 14 inches total length. Special Regulations: Fishing is prohibited from the center dike and posted areas. Wading or the use of boats and other floating devices is prohibited. Season is open the second Saturday in February through September 30, any hour of the day or night on the following waters: Bass, Crappie, North Pond, Beaver Slough and that portion of the Walker River within the Mason Valley Wildlife Management Area. Limit is 2 trout and 15 warmwater gamefish of which not more than 2 may be black bass. Minimum size for trout is 16 inches total length. Minimum size for black bass is 14 inches total length. Special Regulations: Artificial lures only (see Statewide Regulations). Season is open Aug. 16 through Sept. 30, any hour of the day or night. Limit is 5 trout and 15 warmwater game fish of which not more than 2 may be black bass. Minimum size for black bass is 14 inches total length. Season is open on the first Saturday in May, from 8 a.m. to sunset. Limit is 3 game fish of which not more than 1 may be black bass. Note: These ponds are open for one day only. Season is open year around when park is open to public. LYON COUNTY CLOSED WATERS: All waters within the Mason Valley Wildlife Management Area except for those listed above. Season open year around, any hour of the day or night. MINERAL COUNTY CLOSED WATERS: Rose Creek Confluence from the diversion pipe downstream to Walker Lake and Walker Lake within a 100-yard radius of the inflow. Limit is 25 game fish of which not more than 5 may be trout, 5 may be walleye, 5 may be black bass and 2 may be white bass or white bass hybrids over 15 inches total length or longer. White bass or white bass hybrids under 15 inches total length may be included in the 25 game fish limit. Season open year around, any hour of the day or night, except in that portion from Derby Dam downstream 1,000 feet, which is closed to fishing. Limit is 3 game fish except in that portion 1,000 feet downstream of Derby Dam to the boundary of the Pyramid Lake Indian Reservation, only 3 game fish of which zero (0) may be trout (catch and release only) from February 1 through May 31. Special Regulations: In that portion 1,000 feet downstream of Derby Dam to the boundary of the Pyramid Lake Indian Reservation only artificial lures with single barbless hooks may be used from February 1 through May 31. Three (3) trout may be taken as part of limit from June 1 through Jan. 31 of the following year. STOREY COUNTY CLOSED WATERS: Five Mile Reservoir, and the Truckee River from Derby Dam downstream 1,000 feet. Season open the second Saturday in June through November 15, any hour of the day or night. Special Regulations: Only artificial lures with single barbless hooks may be used. Season open May 1 through September 30, 1 hour before sunrise to 2 hours after sunset. Limit is 5 trout, only one of which is longer than 14 inches. Special Regulations: In that portion 1,000 feet downstream of Derby Dam to the boundary of the Pyramid Lake Indian Reservation only artificial lures with single barbless hooks may be used from February 1 through May 31. Three (3) trout may be taken as part of limit from June 1 through Jan. 31. Season is open year around, during public park hours. Limit is 10 game fish of which not more than 5 may be catfish. Special Regulations: Scripps Wildlife Management Area is closed to trespass February 15 through August 15. WASHOE COUNTY CLOSED WATERS: Third Creek and its tributaries from Lake Tahoe to the Mt. Rose Highway No. 431. Incline Creek and its tributaries from Lake Tahoe to Ski Way and the Mt. Rose Highway No. 431. Wood Creek from Lake Tahoe to the Mt. Rose Highway No. 431. Lake Tahoe within a 200-yard radius of the mouths of Third, Incline and Wood Creeks. A 500-yard radius from Sand Harbor boat ramp. Truckee River from Derby Dam downstream 1,000 feet. The Nevada Division of Public and Behavioral Health has issued health advisories that recommend limiting consumption of fish species from seven Northern Nevada waters, due to elevated methylmercury levels. In the Western Region the health advisories recommend no consumption of any fish from the Carson River from Dayton to Lahontan Dam and all waters in Lahontan Valley. No consumption of white bass from Little and Big Washoe Lakes; no consumption of wipers and walleye and no more than one eight-ounce meal per week of any other fish from Rye Patch Reservoir and no consumption of walleye from Chimney Dam Reservoir. For more information, go to www.ndow.org. For information on fishing on interstate waters and license requirements: Lake Tahoe and Topaz Lake, see above. Lake Mead, Lake Mohave and the Colorado River, see Southern Region Regulations. The Nevada Department of Wildlife (NDOW) has stocked STERILE GRASS CARP in the Mason Valley Wildlife Management Area. 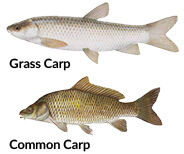 Grass carp are beneficial in controlling the aquatic vegetation, thereby enhancing habitat for sportfish populations. Their behavior is very different from common carp, which can be destructive to sport fisheries. NDOW asks anglers that catch grass carp to please return them to the water unharmed. Images to the right help identify the differences between the two.